DIE Veneris, 7 die Decembris. Message from H. C. with an Order about the Bodies of Cromwell, &c.
Message from H. C. with Bills, and an Order. Orders for Money to be considered. Message to H. C. with a Bill, and the Order concerning Cromwell's, &c. Bodies. Ld. Delawar and Ld. Berkeley. E. of Suffolk versus Pepper. Bill for repairing Highways, &c.
Hodie 2a vice lecta est Billa, "An Act to enable Newton and Oakeley to sell Lands, for Payment of Debts." ORDERED, That the Consideration of this Bill be committed to the same Committee as the Earl of Huntingdon's Bill is; to meet To-morrow in the Afternoon, at Two of the Clock, in the Prince's Lodgings. A Message was brought from the House of Commons, by Titus Esquire, &c.; who brought up an Order for taking up the Coffins and Bodies of Oliver Cromwell, &c. and draw to Tyburne, &c.; (fn. 1) wherein they desire their Lordships Concurrence. Read, and Agreed to with an Addition. That this House will take this Message into Consideration, and return an Answer by Messengers of their own. 1. A Bill to enable Sir Wm. Wray to sell Lands, for the Payment of Debts. 2. A Bill for raising Portions, for Children of Sir Edward Gostwicke. 3. An Order to pay Thirteen Hundred Pounds to Symballs. That their Lordships will return an Answer by Messengers of their own. ORDERED, That on Monday Morning next this House will take into Consideration the several Orders brought up from the House of Commons, for Payment of Monies. To deliver to them the Order concerning taking up the Bodies of Oliver Cromwell, Ireton, &c.; to which their Lordships do agree, with an Addition, to which their Concurrence is desired. 2. To deliver to them the Bill for draining the Fens in Lynco'nshire, and desire their Concurrence therein. Hodie 1a vice lecta est Billa, "An Act for the naturalizing of John Boreel, Eldest Son of Sir Wm. Boreel Knight and Baronet." ORDERED, That the Cause between the Lord De la War and the Lord Berkley, touching the Right of Precedency, shall be heard, at this Bar, this Day Sevennight. ORDERED, That the Judges do deliver their Opinions To-morrow Morning, whether the Words spoken against Earl of Suffolke, by Peper, be released by the Act of Oblivion. 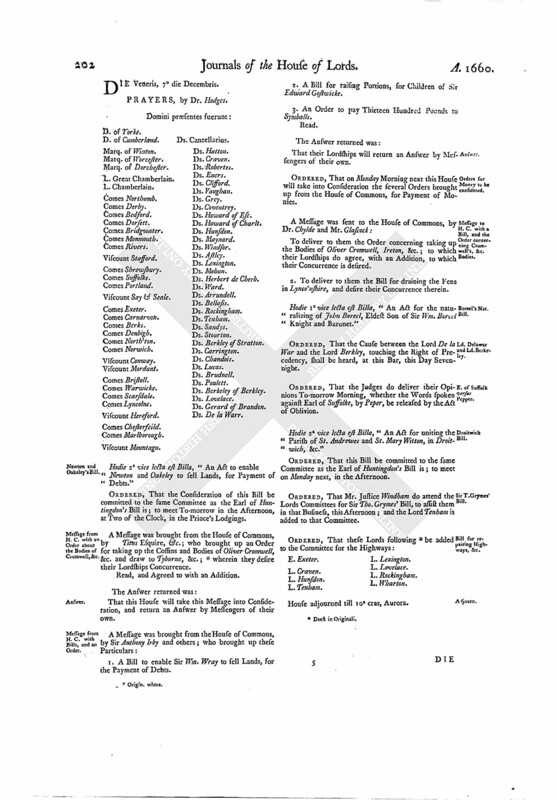 Hodie 2a vice lecta est Billa, "An Act for uniting the Parish of St. Andrewes and St. Mary Witton, in Droitwich, &c."
ORDERED, That this Bill be committed to the same Committee as the Earl of Huntingdon's Bill is; to meet on Monday next, in the Afternoon. ORDERED, That Mr. Justice Windham do attend the Lords Committees for Sir Tho. Grymes' Bill, to assist them in that Business, this Afternoon; and the Lord Tenham is added to that Committee. House adjourned till 10a cras, Aurora.